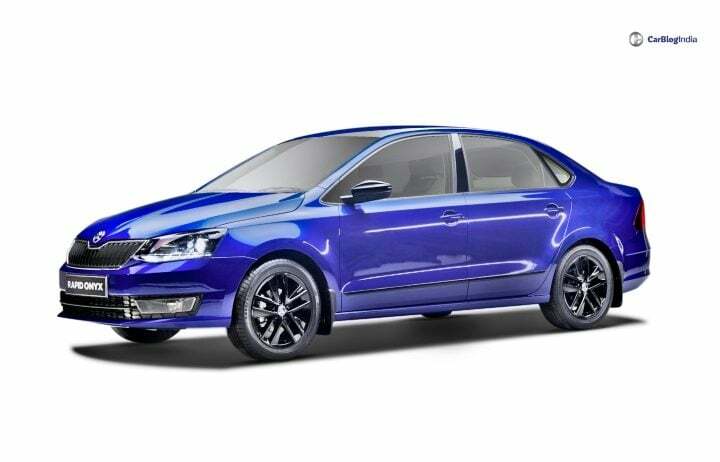 Skoda Rapid Onyx Edition launched; Looks Amazing in Blue! Skoda Rapid Onyx edition has been launched in India. It gets new colour options, projector lens headlights, a new set of alloy wheels, LED DRLs and more features. The limited edition starts at Rs 9.75 Lakhs. Skoda Auto India has launched the limited edition Rapid Onyx Edition in India. The limited edition variant gets 2 new colour options – Lapiz Blue and Candy White – and some other cosmetic upgrades. It comes with Projector lens headlight, LED DRLs, glossy black 16” Clubber alloy wheels and a SuperSport flat-bottom steering wheel with black stitching. These were the major updates that the Onyx Edition got. It is available in both diesel and petrol engines. The petrol engine variant is priced at Rs 9.75 Lakhs and the diesel variant goes up to Rs 11.58 Lakhs (ex-showroom prices). The petrol automatic variant costs Rs 10.99 Lakhs and the diesel AT costs Rs 12.73 Lakhs (ex-showroom prices). Along with these upgrades, it gets a 6.5-inch Colour Touchscreen Central Infotainment System with SmartLink, scuff Plates with RAPID inscription, black waste bin, rear windscreen sunblind, and 12 V power socket in front and rear console. These features are available in the top of the line, Style variant. It also gets the safety features of the top-end Style variant! The Skoda Rapid Onyx Edition now gets Dual Airbags, ABS, Electronic Stability Control (ESC), Hill-Hold Control (HHC), Parktronic Rear parking sensors, and au courant Anti-Theft alarm. Also, dual front airbags and ABS are standard across all variants. The Skoda Rapid Onyx Edition comes with petrol and diesel options. The 1.5 Litre MPI petrol engine produces around 104 BHP of power and 153 Nm of torque. The 1.5 Litre TDI diesel engine produces 110 BHP of power and 250 Nm of peak torque. Both the engines come with an option of 5-speed manual transmission and 6-speed Automatic Transmission. The mileage claim on the diesel engine is around 21 kmpl and on the petrol engine is around 15 kmpl. The Onyx Edition comes with other features such as Front and Rear fog lights, Steering mounted audio and telephone controls, rear AC vents, power socket in the front and rear, height adjustable driver and front passenger seats, Automatic Air conditioning and chrome inserts on the ac vents and dashboard. The Skoda Rapid competes with the likes of Hyundai Verna, Maruti Suzuki Ciaz, Honda City, Nissan Sunny, and Toyota Yaris. In the entire Skoda lineup, Rapid is the largest selling car. However, it still is one of the slow performers in its C-segment sedan, where Ciaz and Verna are the leaders.